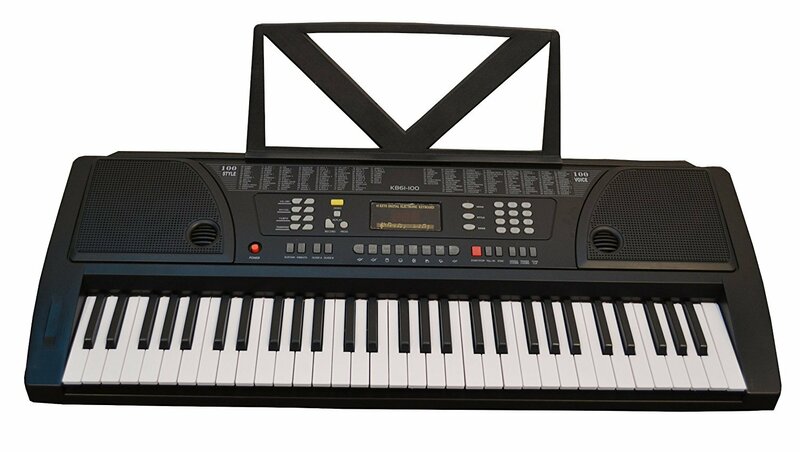 The Huntington KB61 black 61-key electronic keyboard, you get an incredible instrument at an excellent value. Easy to play, with a superb tone quality and a wide range of features and functions, this model is a great choice for beginner or intermediate players. Product Features: 61 Standard Piano Keys. Teaching Type Keyboard. 8 Note Polyphonic. Calibrated Chip for superior tone and tuning. 100 Rythms 100 Voices. 8 Stereo Demo Songs. 8 Panel Drum Presets. Single Chord Function. Finger Chord Function. Start / Stop with Sync. Fill In Function. Sustain and Vibrato. Transposition Function. LED Display. 32 Tempo Settings. 16 Volume Levels. 8 Rhythm Chord Volume Levels. A and B Guides. 1/4 Inch output jack. Stereo RCA output jacks. Power Adapter is included.